Citizens of Boston! A Free Citizen of Massachusetts—Free by Massachusetts Laws until His Liberty is Declared to be Forfeited by a Massachusetts Jury, is Now Imprisoned . . . Boston: s.n., ca. 1855. America, or, The Emancipation of Slaves. Jigsaw Puzzle (ca. 1860s). Fierce words and vivid images were among the tools that radical “immediatist” abolitionists used to further their cause. Instead of gently pleading their case, they employed sensational language to shock people into action against slavery. On posters for abolitionist rallies and meetings, the fervor of the language is matched only by its physical, typographical boldness and size. 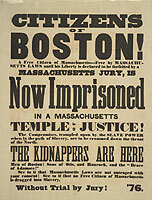 This poster's appeal to the “Citizens of Boston” and “Sons of Otis, and Hancock” to “see that Massachusetts Laws are not outraged with your consent,” conjures up the signers and the principles of the Declaration of Independence to stir the reader to act in favor of the cause. Realizing that sometimes words were inadequate, abolitionists also spoke through pictures. Images used to further anti-slavery agendas idealized and mythologized slaves, thus elevating the abolitionist cause. The jigsaw puzzle “America” offers a mythologized version of liberation by representing American emancipation as a white female, reminiscent of Nike, goddess of victory. Crowned by a halo of stars, carrying broken shackles in her right hand and ivy in her left, the woman stands above slaves, kneeling, praying, and praising her. The responsibility of salvation, the image implies, rests in white Americans’ hands.